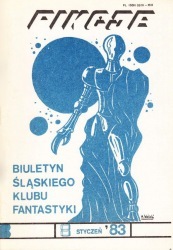 Polish fanzine published by Śląski Klub Fantastyki in Katowice, Poland, from 1983 to 1988. Edited by Piotr Kasprowski. Circulation: 1000-3000. 53 issues were published plus special one with continuation of Star Wars. Fikcje won the prize for the best fanzine in Europe, in Zagreb, during Eurocon '86.